I was coming into the race this year full of confidence that my course pr from 2011 was going to fall based on how well my training and racing have been going this first 6 months of the year. Of course I did have some reservations about that with the lingering effects of the 72 hour race remaining as an unknown until I actually got out there and put things to the test. The weather forecast was looking like it would be about as good as can be expected for a night of Boogie. I lined up near the front and while everyone was wondering exactly where the starting line was located Doug yelled go so we just took off from where we were standing. 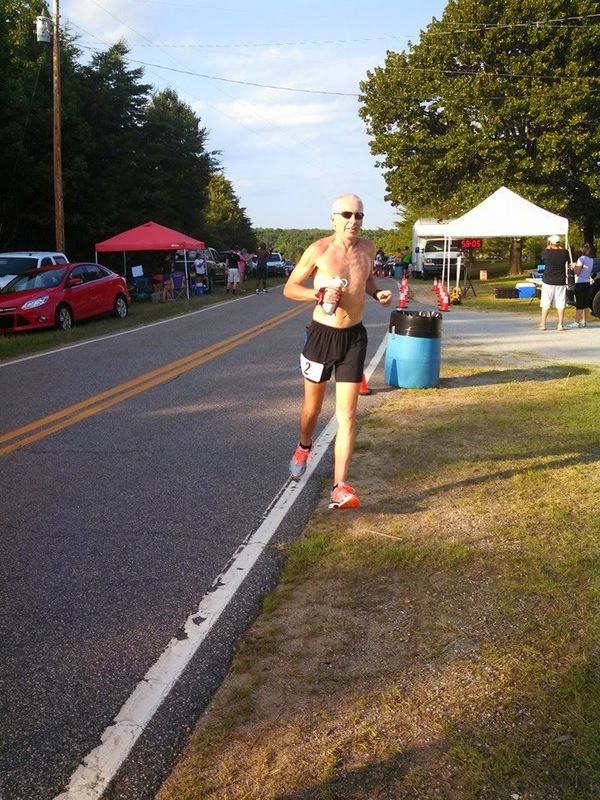 My plan was to run well within myself the first lap and not get over-heated knowing that after the first lap we would be in the shade and the temperatures would begin to slowly drop. It was about 86-87 but that is mild compared to some years. 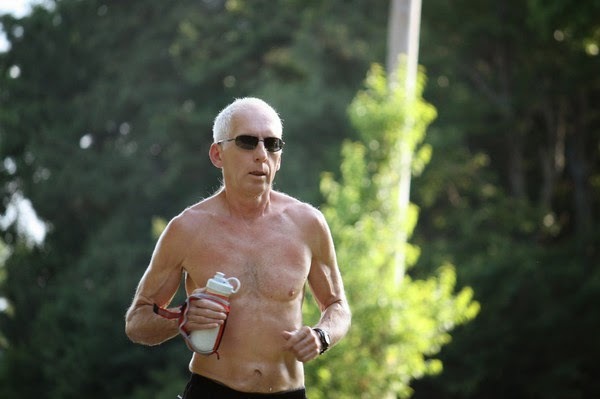 I fell into a comfortable pace and enjoyed some light conversation with the runners around me in those first few miles. I have to say that as I approached the house where the Devil Dog attacked 2 years ago I had a bit of an adrenaline boost but no sign of him around. We came around the first 6 mile loop and I was pleased and a little surprised at the pace because it felt easy. I stopped at my car which I was using as my personal aid station and took a gel and refilled my water bottle . The water at the aid stations is pretty nasty here every year so I had brought my own. In fact I never stopped at the aid stations but once the entire race and I'll tell about that a little later in the report. Normal aid station fare just doesn't have much appeal to me any more and whenever its possible I provide most of my own nutrition. I was quickly back out on the road and headed down the hill. This is about the only time in the race on this out and back spur that you get to see the runners in front and behind you in the daylight to know who they are. Lots of friends and familiar faces and lots of encouragement along the way. I ran strong up the hill and finished the lap a couple of minutes faster than I had planned and feeling good while looking forward to no more sun and cooler temps. As I headed out for lap 2 I stopped at the car once again and slammed a Carnation breakfast shake. I found these to work better than the Kellogs that I used at Umstead because these do not have the 5 grams of fiber which lets just say adds up to way more than my body can tolerate in a 24 hour period ! Refilled the water and off I went. Still feeling good and moving well but I was having a bit of foot pain, so far the only thing I was feeling left over from 3 Days. 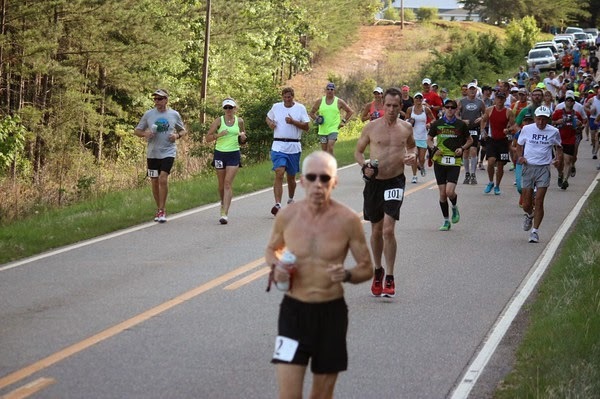 I also noticed my ankle tendonitis which I have had since before Umstead 100 was being bothered by the camber of the roads, ,especially in those first couple of miles each lap so I was trying to find the flattest part of the road as possible. Lap 2 was rather uneventful. By the time I was down to the river it was getting dark and I was having to keep my mouth shut to keep from eating so many bugs along the swampy area. I was not running with a light and as I was climbing the hill I was surprised at how many people were recognizing me and offering words of encouragement and calling my name. I could hardly recognize anyone but I did at least know most of the voices ! BD Sechler caught up to me just as we crested the hill and we ran the next 6 mile loop together. These were some of the most enjoyable miles of the night but I think as we got caught up in the conversation we ended up running a lot of the spots we should have been walking ! As we finished the lap I stopped at my car as he went on to the aid station. We had planned to continue on together but I was never able to catch him. I found out later he had dropped 4 miles later. I had been feeling very good but as I took off down the hill things began to turn on me quickly. I was feeling tired, my hip flexors were aching, the pounding was hurting my feet and the ankle was flaring up and I was forced to take several walk breaks going down. Still lots of runners speaking to me in both directions in the dark. We did have a nice moon, just over half of one that was offering some good light but still nearly pitch black along the tunnel of trees by the swamp. By now it had cooled off into the low 70's but it was slimy sticky feeling as the humidity continued to rise. A haze in the sky prevented many stars from being out at this point. I made it back up to finally complete mile 30 in a slow disappointing time for the lap and took time for a pitstop and then another re-fuel, refill stop at the car and hoping I would feel better now. But, I continued to struggle and things just kept getting worse. I was breathing way to hard, having to take frequent walk breaks on the easy downhill grade that I normally run the whole way. Life was beginning to stink for me and I was doing a lot of moaning and groaning. It was not going to be much fun to have to go on in this condition. I knew I could keep going but the motivation was fading. With half mile to go before reaching the dog pen aid station I was telling myself, ok get it together. Think what you need to do to try and turn this around and be prepared when you get there. I finally shuffled in and immediately sat down and asked for some chips. That was one thing I knew was missing was any sodium other than the little bit in the gels. After about 5 minutes I got up and grabbed a cookie to go to tide me over until I could get to my car. After finishing off the cookie I started to run again and in a few minutes was very pleased that I felt a whole lot better, running all the sections I normally do. No more gasping, moaning and groaning. I just hoped that the feeling would last. When I got to my car I was ready for the rocket fuel so I downed half a bottle of pepsi in addition to the gel. As I headed back down the hill I was very pleased that the hip flexors were relaxed and not aching nearly as much and once again I was able to run all the way down and to the turn. The only real problem was that the feet were still not liking the pounding. I was able to do some decent running coming back up too and I knew now that I could make my goal of a course pr even if I walked the remainder of the evening. As I came through for mile 40 I could see that I had lost an awful lot of time in the those first 4 miles of the previous lap and my other goal of a sub 10 hour was going to be nearly impossible but I decided to give it my best shot and keep pushing. As I headed out on that last lap, it had cooled down into the mid to upper 60's, still slimy humid though. but the haze in the sky had cleared and more stars were visible now as the moon was getting low on the horizon. Crusied by the dog pen and took a gel from my pocket and thanked them for being out there all night for us and moved on. Really enjoyed the now nearly star filled sky along the former dirt road which is the best part of the course for sky-watching . Although tired I was still moving well or at least it seemed that way and I pushed on in hopes of getting that sub 10 finish. But , when I made it back around to the car and just a hair over 4 miles to go I saw my time and the reality was there that I had no chance of doing it. My pace and perceived effort in the dark just didn't match up and I was moving a lot slower than I had hoped. More pepsi and off I went to get it over with. A huge pr was mine now and I thought to myself no need to push it but it's just not my style. As long as I was able I would go for as fast a time as I could. Fortunately I did feel good but tired. As I ran all the way down once again I was making up stupid rhymes and making noises in rhythm to make the time pass and keep my mind from telling me to slow down or walk. And then I was at the turn and just two miles to go ! Anyone can run two miles I told myself, but then usually 2 miles don't include 1.4 of Bethel Hill ! I did run as much as I could, more than the past few trips up and then I could tell as I reached the last little pitch before the curve when you can see the lights of the church. And just at that moment as the church came into view a meteor flashed by to my right seemingly just above the treetops burning brightly ! That brought a smile to my face and then a minute later I crossed the finish line. I was so happy that I had been able to turn things around and feel so much better the last 16 miles or it could have been a real suffer-fest and I probably not have attained my goal. I chatted with the folks there and got my mug while my heart rate dropped and then it was time for me to drop and do 50 pushups. Tada ! Time of 10:14:11 and the course pr by about 32 minutes. 97 runners started out of 120 that had signed up and of those, 50 finished the 50 miles and I placed 16th overall . Another 32 got credit for 30 miles and I guess that leaves 15 that were dnf's before reaching at least the 30. Thanks to Doug and Brandon and all the volunteers for another awesome version of the Boogie !